A ceremony was held in Jakarta, Indonesia, on October 24 to mark the 71st founding anniversary of the United Nations (UN). 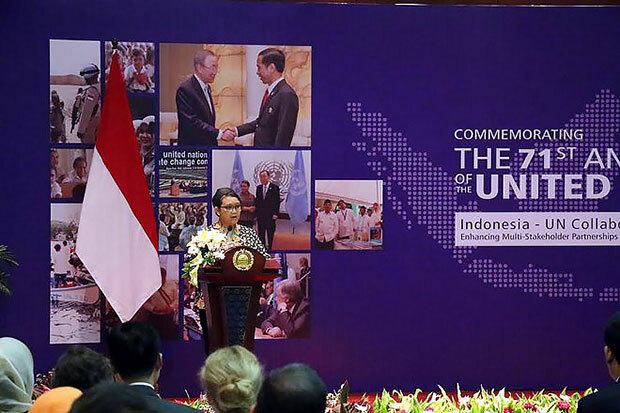 In his remarks, Indonesian Foreign Minister Retno Marsudi applauded the UN’s practical actions to ensure peace, security and human rights in countries across the world. Tens of millions of Indonesians have enjoyed a better life thanks to UN programmes, he said, citing that as of 2014, up to 96 percent of the Indonesian population escaped from poverty and the literacy rate in the country reached nearly 100 percent. Meanwhile, Director General for Multilateral Affairs of the Indonesian Foreign Ministry, Ambassador Hasan Kleib said Indonesia has actively cooperated with other UN member countries over the past years. In the next 15 years, Indonesia will focus on fulfilling its economic development targets, promoting cooperation with other countries and handling socio-economic issues, he said. UN Resident Coordinator in Indonesia Douglas Broderik called on countries to take actions for global goals. The UN will actively partner with Indonesia to bring a better life to more than 250 million Indonesians, he promised. Following the ceremony, the participants attended a workshop on cooperation between Indonesia and the UN for sustainable development./.